The art of heraldry dictates the standards and principles governing the use of colours in the world of the knights. Heraldry stipulates the form, the proportions and the tinctures in a knight’s coat of arms, with a fundamental difference being drawn between the enamels (which can here generally be regarded as the primary colours) and all other colours (the secondary colours, therefore), which are non-enamels. With regard to the primary colours: interestingly, in the Middle Ages, the enamels — the term most probably relates to the physical quality of their surface — were understood to be not only the actual colours of red, blue, green and black (the latter being worn by knights as a sign of mourning) but also metals (gold or yellow, and silver or white) and furs (ermine, reversed ermine, sable and reversed sable, squirrel). Purple or violet were regarded both as colours and metals (referred to in the following as colour-metals). The rules of composition for the basic form of coats of arms and banners were that tinctures and metals must alternate, so that one tincture is never placed next to another, nor a metal next to a metal. The secondary colours, at that time used for jousting tournaments and in the design of livery, include: orange, pink, flesh, blood red, carmine red, chestnut, olive green, green-brown, dappled, green-yellow, cinnamon-brown, grey, nature, pearl and peach blossom. If the traditional order of colours around the colour-circle is adopted, the primary enamels (colours, colour-metals and metals) can be arranged around three outer circles, and the secondary colours around an inner circle. The centre of the circle is occupied by the dappled colour resulting from the combination of various primary and secondary colours, including the iridescent colours. Black and white or silver are arranged adjacently, even though they come to lie on different orbits; grey lies on the intersection of the continuation of the vertical line connecting black and white with the circle of secondary colours. Blue also lies on the outer orbit, but opposite black, and green and red can be found on the horizontal. Gold or yellow are placed opposite purple, which in heraldry is granted a wider arc on the scale — namely from lilac to red. The secondary colours are arranged on the inner circle in the following way: assuming the sequence of the outer shell, the green hues of olive-green, green-brown, green-yellow, etc. lie within the segment between green and yellow or gold, while in the red segment a wide pallet of colour-hues extend from cinnamon through flesh to peach blossom. This mediaeval tradition unites two aspects of a knight’s nature: the Nordic or Germanic warrior, the heathen and protagonist of legends and heroic feats — the vagabond, in other words, constantly striving in jousting tournaments or other acts of bravery to attain honour both for his name and for his coat of arms; nevertheless, a Christian ethic is also evident, with the knight as Defender of the Faith and crusader to the Holy Land under the symbol of the Cross. This double nature requires a precise definition of the relationship between Christian and secular virtues, and the association of colours with these virtues forms the core of the heraldic colour-system. 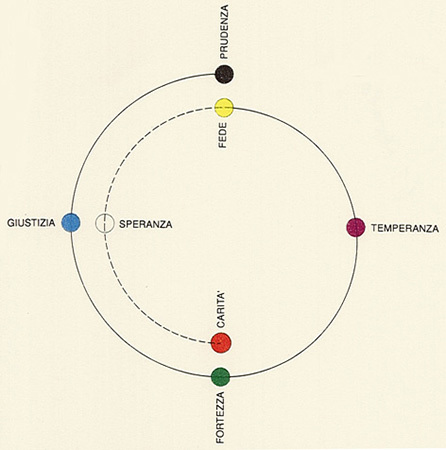 In the small illustration, the seven virtues are shown in a spiral with their associated colours. The spiral is intended to represent this crescendo as a deepening involvement. 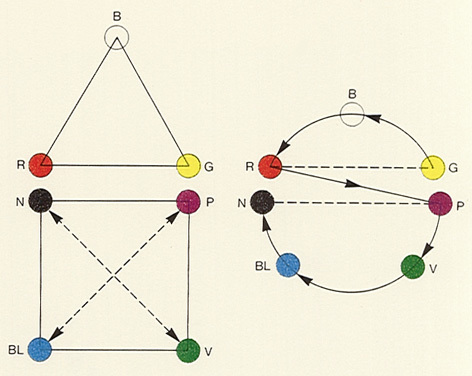 At the same time, this type of portrayal is a possible model for chromatic arrangements along both vertical axes, thus illustrating the complementary relationship of opposites. The two smaller illustrations depict a less-restricted interpretation of the relationship between the three Christian and the four secular virtues, and once again adopt the theme of the relationship between even and odd numbers which result in the not insignificant number of seven. One figure comprises a square whose corners can be ascribed the colours of the secular virtues and their meanings. The square’s diagonals connect the opposites and illustrate their complementarity: temperance (purple or violet) in justice (blue); a fortitudinous (green) prudence (black); and the reverse. At its corner points, the triangle is assigned the colours and meanings of the Christian virtues. Both these shapes illustrate that heaven is above earth and that both represent an independent principle: despite there direct association, there is no actual point of contact between them. If this interpretation is taken a step further, the combination of square and triangle can also be conceived as a body: a pyramid with the stable base of a square to represent the earthly; and then the four triangular sides reaching upwards to create the firmament above the earth, culminating in unifying hope. This static interpretation, with its basis in form, is placed opposite the dynamic. 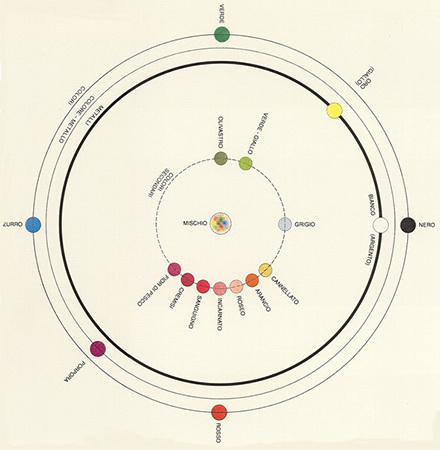 The colours of the Christian and secular virtues are arranged on a circular line; they are all incorporated within the same form here, but the Christian virtues move in the opposite direction. So once again we encounter two independent principles which, although they have no actual point of contact, have a direct association all the same. This was experienced by Parcival, who devoted his life to the search for the principal truism of the age of chivalry in which he lived, which alone could reveal to him the Holy Grail: the great dilemma of compassion, shown in the diagram as the link between red and purple, and between charity and temperance. Bibliography: D. L. Galbreath und L. Jéquier, «Lehrbuch der Heraldik», Lausanne 1978; John Gage, «Colour and Culture, Practice and Meaning from Antiquity to Abstraction», Thames and Hudson, 1993, pp. 79-92.